The Smithsonian National Air and Space Museum presented the 2012 Trophy for Current Achievement, its highest group award, to the NASA Cassini-Huygens Mission to Saturn on March 21 in Washington, D.C. 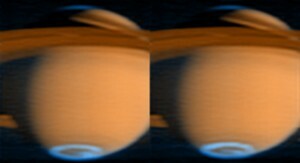 The Cassini spacecraft carries the LASP-built Ultraviolet Imaging Spectrograph Subsystem (UVIS), which measures ultraviolet light in Saturn’s system to better understand the planet’s atmospheres, rings, and surfaces. The annual Smithsonian trophy awards recognize outstanding achievements in aerospace science and technology. Cassini’s Saturn discoveries include four previously unknown moons; two new rings; geysers on the moon Enceladus that spray water vapor and icy particles; and stream-like channels and lakes on the moon Titan. LASP built and operates the UVIS instrument onboard Cassini and controls UVIS experiments. The instrument is comprised of four telescopes that measure ultraviolet light. These measurements provide information on the chemistry, clouds, and energy balance of the Titan and Saturn atmospheres; the atmospheres and surfaces of Saturn’s icy satellites; and the structure and evolution of Saturn’s rings. The current Cassini Solstice Mission will run through September 2017.